With a console as popular as the Nintendo Switch comes a whole host of game enhancing accessories. 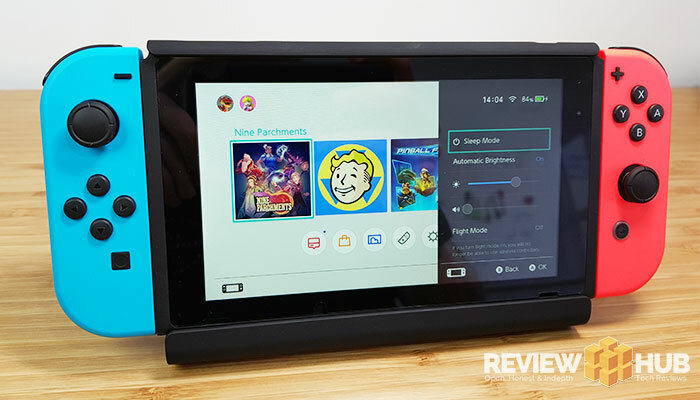 This time we’re reviewing the Switch S-Charge charging case which promises to triple your gaming time! But at what cost? UPDATE: The S-Charge bundle has dropped to as low as £35 / $45 on Amazon, making it a much more cost-effective investment. While the Nintendo Switch’s battery life lasts around 3-5 hours on average, utilising its inbuilt 4340mAh battery, you can expect to triple this with the S-Charge Switch case. This is thanks to its whopping 10000mAh’s of battery power. But is strapping a battery charging case to a handheld gaming console really a good idea? Well, we’ve been testing the S-Case for the last two weeks to answer that exact question. 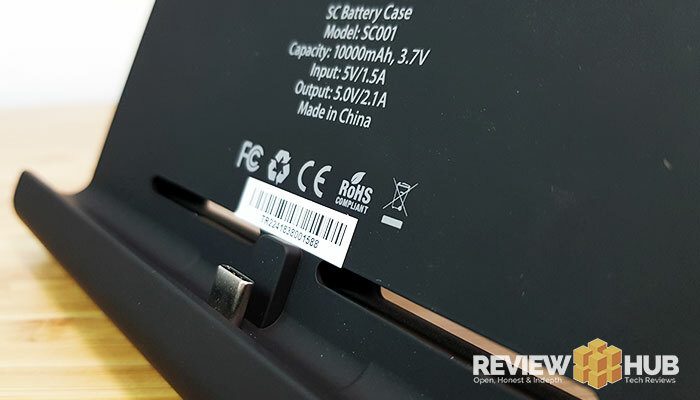 Read on to find out whether the S-Charge Switch case is worth the £65 / $79 asking price. Opening up the slide box of the S-Charge, if you’ve chosen the bundle, you’ll be greeted with the carbon fibre case. The case quality is good, but it’s pretty generic looking, and nothing on my favourite case, the slimline InnoAura case (Amazon). Next, you’ll find the S-Charge itself which is created from a premium soft-touch plastic. Inspecting it closely for any manufacturing errors or build quality issues, and the S-Charge passes easily. It scores a solid 8/10 for build quality only losing a couple of points due the lack of grip on the kick out stand. It’s also worth noting that the stand feels a little on the delicate side. 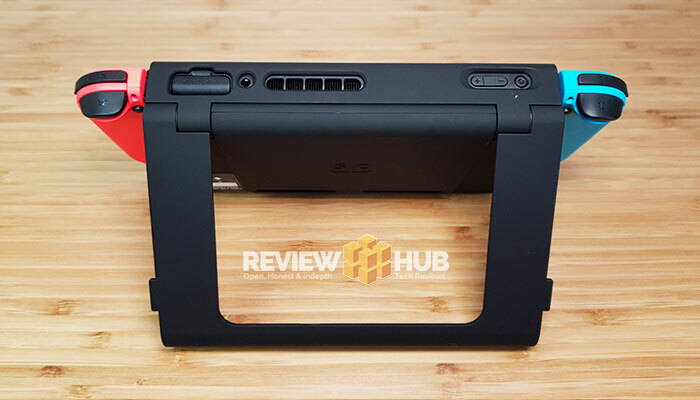 Attaching it to your Switch is easy, the top section folds back 90 degrees letting you easily place your Nintendo Switch into the S-Charge. You then rotate the top part back down for a snug and secure fit. After playing 12 rounds of Mario Kart 200cc in tilt mode, I’m confident in the S-Case’s won’t be falling off anytime soon. Built into the top is the heat vent hold for the Switch fan and there are also holes to let you switch cartridges and access the ports without removing the case. While promises of tripling your Nintendo Switch’s battery life may seem like a no-brainer, it’s a little more complicated. 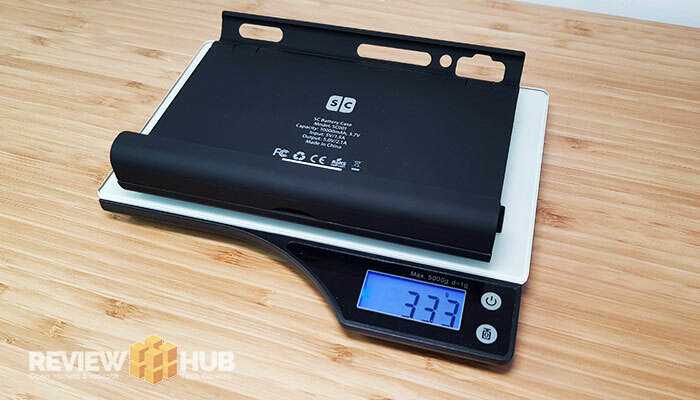 The S-Charge weighs in at 333 grams which essentially doubles the weight of the Switch in handheld mode. Now I find the Switch already on the limit of what I can hold comfortably with two hands, so adding on the S-Charge made my hands buckle in under 10 minutes. There are plenty of 3rd party Switch cases that add extra grip and improve the comfort, but most of these will no longer fit properly when used in combination with the S-Charge case. So who exactly is the S-Charge for? The S-Charge works best if you’re playing on the go but using a wireless controller. 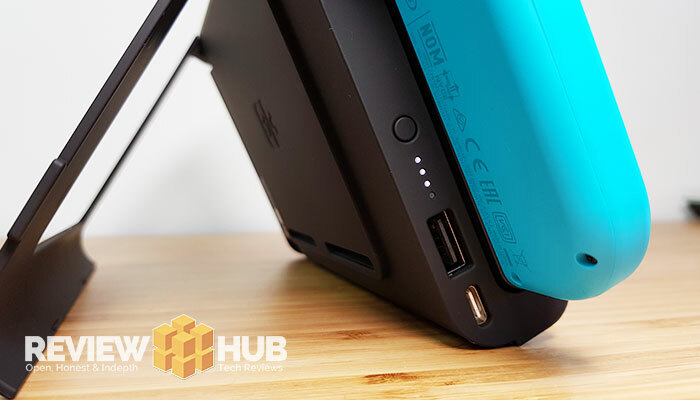 You get the benefit of a much sturdier kickstand, you triple the battery life and also add a protective barrier between your Switch and the surface it’s sitting on. You can even charge your pro controller or phone at the same time as your Switch. Take away this use-case though and I’m finding it hard to see the benefit of the S-Case over a traditional powerbank. The inconvenience of a charging cable, for me anyway, will beat the double the weight of my already heft Switch console. At the time I received the S-Charge charging Nintendo Switch case, it was selling for around £65 for the bundle version. For me, the limited use of the case coupled with the high-asking price made it too much of a reach. Since finishing this review, the S-Charge Bundle has dropped to a low as £35 on Amazon making it a much more attractive deal. 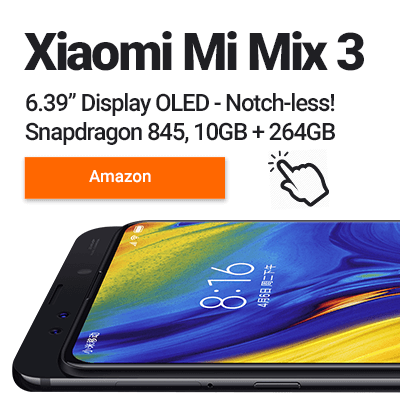 When you consider you could be paying £15-20 for a case alone and a 10000mAh power-bank will set you back £15-20, the S-Charge bundle looks very attractive indeed. Now the bundled case itself is nothing special, missing any branding and a little on the loose side with the switch inside. But you do get a couple of screen protectors added in, and the build quality is good. While the S-Charge is charging your Nintendo Switch as you play, you can also top up your other gadgets. With a healthy 10000mAh of juice, this isn’t just a gimmick either. If you’ve got your S-Charge on you, you can leave your power bank at home. It uses an output of 5V/2.1 amps, with a handy LED indicator to let you know how much charge is left. 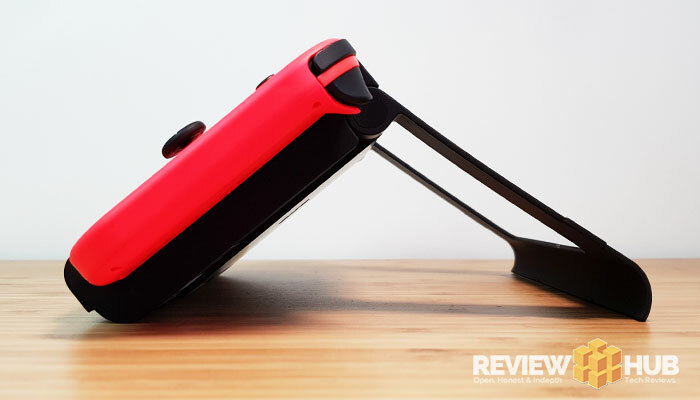 As you can see from the picture above, the S-Charge kickstand is much more versatile than the included Switch kickstand, which is quite frankly, crap. To use the stand you pull each side to release it and then position at what angle suits your gameplay best. Having a much wider area of contact with the surface also means that it’s much more stable than the built-in switch stand. I would have liked to see some rubber or grips along the bottom of the stand to help keep it firmly planted when using on planes or in cars. The kickstand is made from the same plastic as the rest of the case. Finally, while the stand is a big improvement I couldn’t help feeling it’s a little flimsy. It bends quite and bit and I have the feeling that it’d snap if dropped or twisted incorrectly. A thin support bar across the middle would go a long way in future iterations. Definitely not a deal-breaker though. Now I’ll be completely honest, the S-Charge Switch case isn’t for me. I spend most of my time with the Switch set up in dock mode. And when I do go travelling the extra 300 grams of weight is enough to put me off. Saying this, I can still see the appeal if you play your Switch on the go a lot making frequent use of the Kickstand. If not, then you might be better off buying a Switch compatible Powerbank and a longer Type-C cable. 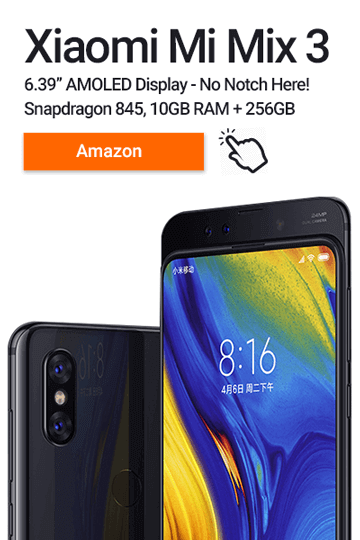 In terms of build quality and design it scores highly, but, the question at the back of my mind is; do we really need a 330 gram Switch battery case in the first place? Comment below.